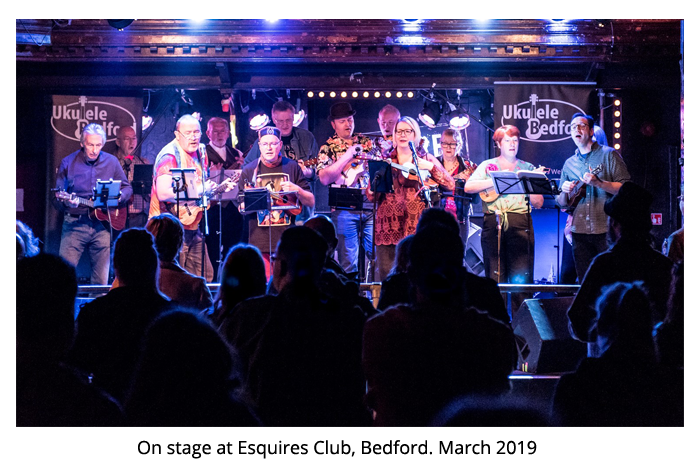 We are a community ukulele group based (oddly enough!) around the Bedford area. We meet weekly at The Kings Arms (24 St Mary’s Street, Bedford MK42 OAS) on Wednesdays at 7.30pm, and 'play out' quite regularly. We are always delighted to see new members - so come along one evening and give it a try! Just learning? Come on in. Been playing for years? Welcome - we'd love to benefit from your talents. 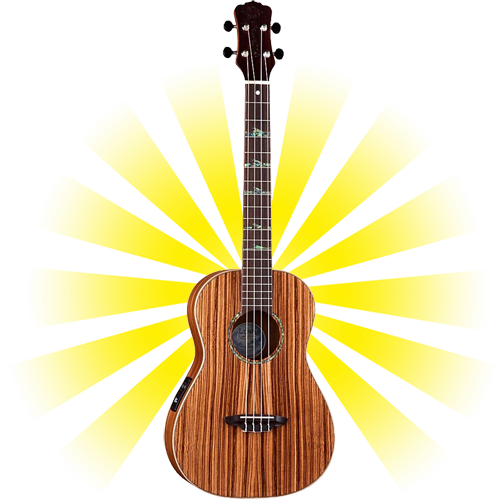 All you need is enthusiasm - we can even lend you a ukulele for the evening! The short answer to that is "Anything the members of the group want to!". From 1930's tin-pan alley to jazz standards. From 60's novelty pop to 90's rock to last year's hits. Admittedly, when we try them we find that some things work better than others on massed ukuleles - but just trying to play the seemingly unsuitable can be great fun. And sometimes surprisingly successful. Members old and new are always encouraged to select songs they'd like to try playing. "There were 18 of us there last night - a combination of illness, holidays and general life going on saw to the reduction in numbers. However, we still made a good racket! The first part of the evening was the Open Mic session, which saw contributions from Lisa, Mike, Rebecca, David and myself. (Have I forgotten anyone? That doesn't seem enough!). Special mention to Lisa who had actually learned her song. No paper/tablet in front of her as a crutch - she faultlessly remembered it. Special bonus points to anyone else who does that in future, it was impressive. But well done to all those brave or daft enough to perform. Then on to the main part of the evening. Jo had kindly come up with a list for us to play through - a sort of answer to Rebecca's Love > Murder > Prison tale of woe from last week! We decided that (for a change and because there were quite a few missing) we would hold off on the Brungstrum 5 playthrough this week and just flesh out the playlist with others from the older songbooks as we went along. It is interesting that when a relative newcomer to the group (as Jo is) selects the songs, they don't know whether they are regular choices, occasional ones or things we have tried and puffed out our cheeks at. So (as you would expect) we had a few of all types as we went along. There was one we didn't try ('Fox On The Run') as we didn't really know half of it at all. That didn't stop us getting all the way through 'Before You Accuse Me' however. If there was a musical lowlight of the evening, I think it was 'Bridge Over Troubled Water'. We made it sound so leaden that we would have been anchored to the bottom of the river, never mind on the bridge over it! A combination of bits we knew better than other bits and a too-slow strumming pattern probably sunk it for good. But actually I think it's a good thing to try songs even if they don't work out. Some songs just aren't massed ukes/voices songs or just dont suit us! On the positive side, from Jo's list, as well as the ones we normally do OK, 'Somebody That I Used To Know' went better than it often has, and of the extra selections made as we went along, 'Viva La Vida, 'Yellow' and 'Somewhere Only We Know' went very nicely. Thanks to Jo for the list! We finished up with a raucous 'City of New Orleans'. Next week is a 'normal' (in inverted commas!) meeting from 7.30. We WILL be doing the M's from Brungstrum 5 next week - I suggest everyone gives them a look beforehand. There is only one N - so we may squeeze that in as well. We could do with a artisan, curated, hand whittled list as the backbone for the rest of the evening - so if we didn't play your favourites over the last few weeks, just make a list of them and send it over. Or theme one around Easter, Brexit, the start of the cricket season, Oxford United avoiding relegation or something... the world is your lobster. See you all next week"